Aqua (Water/Eau), Alcohol Denat, Butylene Glycol, Hamamelis Virginiana (Witch Hazel) Water, Lactic Acid, Salicylic Acid, PEG-40 Hydrogenated Castor Oil, Hydroxyethylcellulose, PPG-26-Buteth-26, Alcohol, Sodium Hydroxide, Glycerin, Parfum (Fragrance), Niacinamide, Panthenol, Disodium EDTA, Sodium C8-16 Isoalkylsuccinyl Soy Sulfonate, Lavandula Angustifolia (Lavender) Flower Extract, Ascorbic Acid, Echinacea Purpurea Extract, Sodium Hyaluronate, Cymbopogon Schoenanthus Extract, Cymbopogon Shoenanthus Oil, Linalool, Propylene Glycol, Limonene, Epilobium Angustifolium Flower/Leaf/Stem Extract, Hypnea Musciformis Extract, Camellia Oleifera Leaf Extract, Betaine, Citronellol, Saccharomyces Lysate Extract, Sargassum Filipendula Extract, Sorbitol, Saccharomyces/Magnesium Ferment, Glycyyhiza Glabra (Licorice) Root Extract, Saccharomyces/Silicon Ferment, Saccharomyces/Copper Ferment, Sodium PCA, Saccharomyces/Zinc Ferment, Saccharomyces/Iron Ferment, Geraniol, Citral, Farnesol, Phenoxyethanol, Benzyl Benzoate, Retinyl Palmitate, Yucca Schidigera Root Extract, Tocopheryl Acetate, Gellidiela Acerosa Extract, Proline, Poterium Officinale Root Extract, Cinnamomum Cassia Bark Extract, Zingiber Officinale (Ginger) Root Extract, Serine, Glycine, Glutamic Acid, Lysine, Alanine, Arginine, Threonine, Allyl Methacrylate Crosspolymer, Retinol, Polysorbate 20. I use this in place of BP as I find it easier to get hold of. It's great at bringing spots to the surface and then getting rid of them. It clears my skin up really well. One drawback is that the tube is pretty small and I use this product in the same way that you would use the BP in the regimen so it runs out pretty quickly but it might be a good alternative for people who struggle to get a hold of BP or find that it is too harsh on their skin. Reduces redness, calms skin quickly. Stops hard, under the skin spots from growing and reduces them. Reduces redness and calms skin Pleasant smelling gel, easy to apply, doesn't dry skin as much as BP Could be stronger For stubborn, hard under the skin spots/painful nodules. 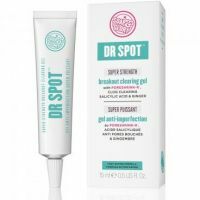 I find that using Dr.Spot, although it doesn't stop them from coming back, is fantastic for minimising size/swelling right down and stopping a hard spot from worsening. Even more effective if left over night. It makes spots much easier to cover up if you wear make up too due to it's green formula. I prefer it to Benzoyl peroxide as it doesn't dry your skin out/sting nearly as much! I'm surprised there aren't more reviews of this product, it's really great. Not sure if you can get this outside the UK? I buy it in Boots.